Cognizant is conducting an Off Campus Drive for Freshers 2017 and 2018 batch B.E/ B.Tech pass outs across India. As we all know that Cognizant is a leading company in IT, consulting and outsourcing services. Most of the job aspirants dream is to find a job at a company like Cognizant. Here is the opportunity. Cognizant is going to start the off-campus drive for 2017 and 2018 batch freshers. Freshers should have a minimum of 60% throughout the academics. At the time of joining, all recruits must have a minimum of 60% (all subjects taken into account) in the pursuing degree without backlogs. Candidates should have strong English writing skills and Oral Skills. 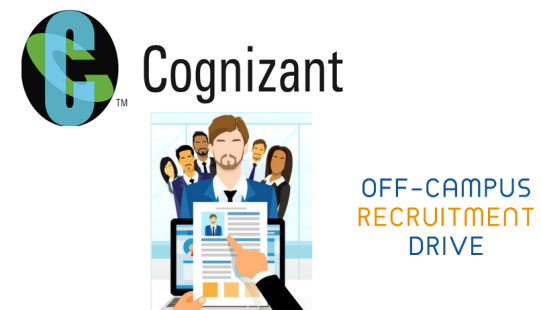 Candidates should be flexible to relocate across any Cognizant branch within India. The maximum gap of only 2 years in education is allowed. Willing to relocate to any Cognizant location in India and also able to work in 24/7 rotational shifts. 2017 and 2018 Candidates with all certificates of provisional diploma/convocation, school, college mark memo, PAN card, and passport are only eligible to participate. The recruitment process has 4 rounds. As per the Cognizant and AMCAT combined advertisement, the venues for the current Cognizant Off Campus Drive 2019 are Kolkata/ Delhi/ NCR/Bangalore/ Pune/ Chennai/ Coimbatore/ Hyderabad. Interested and Eligible candidates/Freshers can apply for the Cognizant Off Campus 2019 drive from the link given below.